Perhaps the most painful thing that you could ever take is getting comments saying that you look older than your age. The worse thing is you think they are right because deep inside you feel tired and old. It is time that you turn these thoughts and remarks into something beautiful. Why don’t you start with your under eye puffiness? Under eye puffiness is a normal sight here in Singapore. There are times that you can wear it proudly because it means you worked hard but most of the time, under eye puffiness is not a pleasant sight. Feeling fresh is really a struggle these days especially if you see your eyes droopy and tired. The bags are pretty annoying and it is the classic sign of fatigue and stress. Get some potato: Most people only know cucumber. It is time that potatoes are introduced. Potatoes can help with diminishing the size of the puffiness. You will see improvements as soon as you get rid of the potato from the eyes. Make sure to refrigerate the potatoes first before slicing it into two. Place the potatoes so it will cover the problem area and then leave it be for at least fifteen to twenty minutes and voila – you will see the difference. Allow some milk: If you noticed that your under eyes are too puffy than normal, you have to consider the help of milk. Make sure it is chilled. In a pan, dip the cotton pads and place it immediately on your eyelids fir twenty to thirty minutes. This can help cool off the eyes. Get some oil: Another regimen that you can use is adding vitamin E to a bowl of water then dipping cotton pads. You should immediately put it on your eyes for twenty to thirty minutes. This can help with the swelling. Tea bags: If you have tea bags, you can use it. You should first chill it by putting it in cold water and putting it in the refrigerator for few minutes. 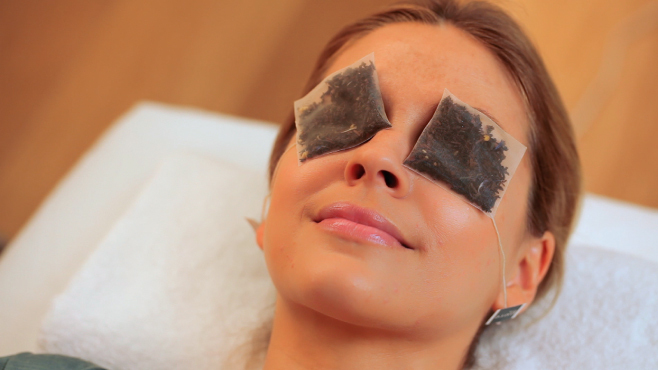 The two tea bags should be placed over your eyes for at least thirty minutes. After that, you can wash your face and eyes using cold water. You will surely feel rejuvenated. These are just some of the things that you can consider when you think about improving eye puffiness.